Our Christmas celebrations we're book-ended with a visit to Ysbyty Gwynedd - our local Hospital. As I've already mentioned in the Christmas post, Mark took Martha in to have her NG tube replaced on Christmas morning...but on Sunday we had to take her in urgently. Mark let me have a lie in Sunday morning and took Martha downstairs for the 8:30am feed by himself. By 9am he was in our room with Martha in his arms - she had vomited her entire feed plus her meds while her Milk was going down her tube. Martha was fine in herself so I blamed it on Mark not bringing any wind up for her. giving Martha her 12:30 feed, she had a bit of a stuffy nose so only took about 20ml orally. I drew up her meds, tested her tube and popped them down the NG tube, then the remainder of her milk followed. Roughly 40ml (of an 89ml) had gone in (to her stomach) and Martha started vomiting in her chair. I stopped the feed, lifted her out and sat her on my knee while she emptied the entire contents of her stomach on to our living room floor. By this point I was panicking. I was on my own with the three kids, me and Martha both covered in sick and a huge puddle on my living room floor. But why was Martha suddenly bringing up her feed as soon as it was entering her stomach? I called Great Ormond Street and spoke to one of the nurses on Bear Ward. To her it sounded like either Martha had a tummy bug, or her NG tube was too high or too low - and vomiting was her stomach's reaction to the milk entering it. She advised for us to take Martha to our local as we have open access and have an X-Ray to check on the position of the tube. When you've spent 10 weeks in a brand spanking new building where everything is "state-of-the-art" - Dewi Ward has a lot to live up to. We explained to the nurse what had happened at home that day and told them what Great Ormond Street had said - but I was going to have a battle on my hands. A short while later the Registrar came in and we had to go through it all again. 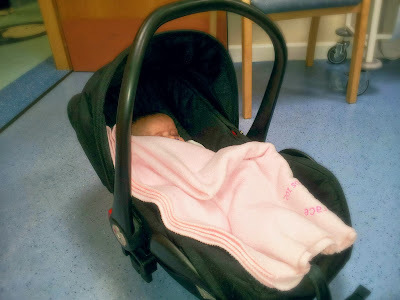 She listened to Martha's chest and was happy that it sounded clear so the didn't have Bronchiolitis. What she wanted us to do was give Martha her 4:30pm feed in the Hospital and wait to see if the same thing happened again. I was not happy with that so I told her so, if it already happened twice at home - what exactly would we gain from watching it happen again other than putting Martha through more distress. For my own piece of mind and for my daughter's health I needed to know that her tube was in the correct position before I fed her again - and I wanted her to have an X-Ray. Apparently I can't just "request" an X-Ray for my child; the bulls**t reason they gave me is that they don't want to expose her to too much radiation (when in GOSH, she had one almost every other day to check on chest infections and tube positions etc). But the real reason is down to cost. This was further confirmed when they eventually agreed to let Martha have the X-Ray, the nurse taking us there said that even with a Urine test - unless the patient is seriously ill they won't do them because it costs £170 to send a sample off to a lab. But if your child/ relative is sick - do you really care how much a urine test cost? No you don't - you will just want them to get it done. During her time at GOSH, if Martha ever spiked a temp the first thing they would do is send a urine sample to the labs (it happened daily almost with Martha Grace) followed by swabs of each scar, from her nose, eyes, stool samples, blood cultures... Antibiotics we're always given as a precaution and weren't stopped until results we're back from the labs. Cost never came in to it. This isn't the nurses fault, it's just the sorry state of the NHS these days. Cost is put before the needs of the patient and it's a shame. Chief execs in their perfectly furnished offices (funded by the public purse) make all the decisions on how money should be spent, with almost complete disregard for the Doctors and Nurses working on the front line who are fighting a losing battle, or the patients in desperate need of healthcare. The X-Ray showed that the tube was in the right position and her Lungs looked clear of infection. We left not really knowing why she was vomiting. She kept the rest of the day's feeds down after that on Sunday, but on Monday morning she had a bit of a coughing fit about a half an hour after her breakfast feed - and vomited again. I just put this one down to the fact that she'd coughed and wasn't related to her episodes the day before. She's been perfect ever since then though. Sorry that this was a post about vomit, but this is what happens with a CHD baby. Also, this post isn't intended to slate the NHS - we are very lucky to have it and owe Martha's life to them. But - the wrong people are in charge - to the detriment of our family's health.